EASTEEN ( Arabia ), September 30, 1935. Sir, Jedda, Septemher 10, 1935. Government of the grant of an oil concession in Qatar by the Sheikh of Qatar. on which I felt he was not expertly informed. 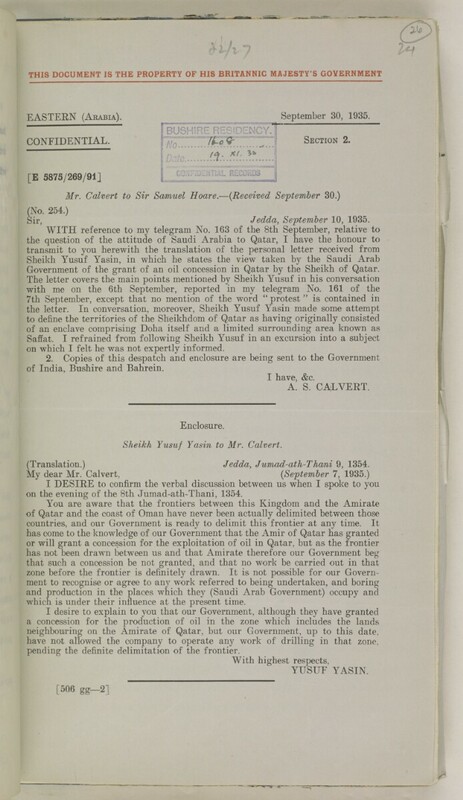 of India, Bushire and Bahrein. Sheikh Yusuf Yasin to Mr. Calvert. (Translation.) Jedda, Jumad-ath-Thani 9, 1354.
on the evening of the 8th Jumad-ath-Thani, 1354.
which is under their influence at the present time. pending the definite delimitation of the frontier.